Errorless Global Mean Sea Level Rise | Watts Up With That? Have you ever noticed that whenever NASA or NOAA presents a graph of satellite-era Global Mean Sea Level rise, there are no error bars? There are no Confidence Intervals? There is no Uncertainty Range? In a previous essay on SLR, I annotated the graph at the left to show that while tide gauge-based SLR data had (way-too-small) error bars, satellite-based global mean sea level was [sarcastically] “errorless” — meaning only that it shows no indication of uncertainty. This version of the graph does not have the seasonal signals removed [meaning it is less processed], shows the satellite mission that produced the data, and rather interestingly shows that, as of yesterday, satellite-derived Global Mean SLR has slowed to 2.8 ± 0.4 mm/year. NOAA NESDIS STAR has been reporting this as 2.9 ± 0.4 mm/yr since 1994, but earlier this year, in January, they were reporting it as 3.0 ± 0.4 mm/yr. But the point is, in the graph shown above, captured yesterday; nothing is shown to indicate any measure of uncertainty — none at all. Readers who have followed my series here on Sea Level Rise, or who have followed Dr. Judith Curry’s series at Climate Etc. (or Rud Istvan’s essays there) are already aware that satellite-derived sea level data is seriously confounded by factors orders of magnitude greater that of the actual rise of sea surface height and, while the magnitudes of those confounders can be estimated, their specific values can only be guessed at. Never-the-less, these estimated values are then used to “correct” the satellite results. 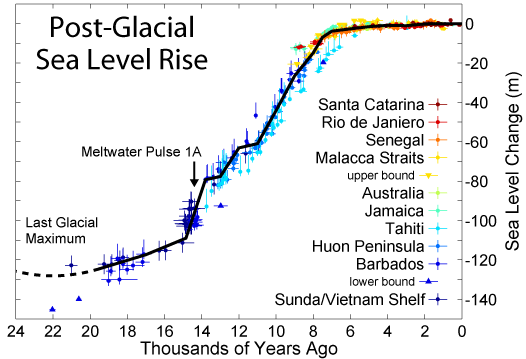 This fact means that there must be a great deal of uncertainty in the final values graphed as Global Mean Sea Level. Why do we never, ever see this uncertainty shown on the resultant graphical presentations of satellite-derived GMSL? Part of the answer is that, in Science today, there is the odd, and wholly incorrect, idea that “if we average enough numbers, average enough measurements, then all uncertainty disappears” [or something like that — I have written about this issue, and battled ‘statisticians’ in comments endlessly, in my series on The Laws of Averages]. Despite this odd belief, there still holds the idea of the “standard deviation of the mean” and its related (but not identical) “standard error of the mean”. While these can be tricky concepts, it is enough here to say that “The standard deviation, or SD, measures the amount of variability or dispersion for a subject set of data from the mean, while the standard error of the mean, or SEM, measures how far the sample mean of the data is likely to be from the true population mean.” [source]. We find the source of the numerical data that makes up the satellite-derived GMSL graph in a text file of the data made available on a regular basis by NASA/JPL’s Physical Oceanography Distributed Active Archive Center (PO.DAAC). In that text file? There we find, in column 9 “GMSL (Global Isostatic Adjustment (GIA) applied) variation (mm) ) with respect to 20-year mean” and in column 10, “standard deviation of GMSL (GIA applied) variation estimate (mm)”. The standard deviation of the individual Global Means is very consistent and averages around 92 mm. 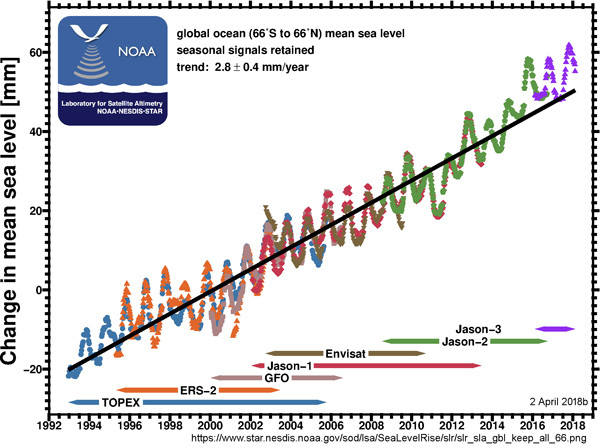 The change in global mean sea level, over the entire 25-year satellite era, is about 100 mm. All of the SD whisker bars overlap all the other SDs by about 50% (or more). 1) Accuracy and precision of the GMSL derived from satellite data? 2) The likelihood that the delta (change) in the 25 years of satellite data is actually significant? Author’s Comment Policy: This essay is not about Global Warming, Global Cooling, Carbon oxides, or Climate (changing or not). It is about the “measurement” of the height of the sea surface via satellite altimetry and the derivation of the [probably ‘imaginary”] metric that NOAA/NASA calls Global Mean Sea Level (and its rise or fall). Remember: Sea Level and its rise or fall is an ongoing Scientific Controversy, especially in regards to its magnitude, acceleration (increasing or decreasing speed of change), significance for human civilization and causes. The consensus position of the field may just be a representation of the prevailing bias. Almost everything you read about it, including this essay, is tainted by opinion and world view. I look forward to reading your opinions on the questions posed at the end of the essay. If your comment is direction at me, please begin it with “Kip…” so that I don’t miss the opportunity to respond. A humble scientist is a wise scientist. Let’s admit that there are many, many people in the world who haven’t accepted the fact that the planet will always face an uncertain future, with imperfect measurements, and with imperfect knowledge, humans, and politics. Brilliant. There are things we don’t know. There are things we can’t measure. There are things we will never know. But man’s SCIENCE ego can’t cope with that. The more we learn about our planet, climate, etc., the more we should realize just how little we actually know. Let’s call that ‘man’s pseudo science ego’. Real science knows very well that there are unpredictable systems or problems that cannot be solved. “ Knowing the extent of our ignorance is knowledge. Pat Frank has said that he never met a climate “scientist” who understood the difference between precision and accuracy. I will go further. Based on reading a lot of climate “scientific” reports I will say that I doubt whether there are very many climate “scientists” who understand that the p-value is NOT the probability that the null hypothesis is true. Oh I forgot they don’t even test for the null hypthesis. Most vaccine defenders don’t even understand that “no statistically significant result” is not “no result” and even less “result is no increase risk of disease for those vaccinated”. Any result even with p>.05 is worth mentioning, esp. if it suggest a very serious risk with a drug that has marginal benefits (or no benefit as some vaccines that were found to have stopped working). They say “negative results are not often published” but negative results regarding nasty side effects of vaccines are published much more liberally than positive results showing a side effect. And the usual useful idiots want to reduce the usual .05 limit of “significance” – obviously in order to hide even more side effects of drugs. To add another dimension that that beautifully succinct opening sentence, there is no such thing as a humble ‘science communicator’. ‘Science Communicators’ are the marketing department whose sole duty is to pump up the public perception of the significance of research and to prepare junkformation to use in lobbying the funding decision makers. Scientist’s these days are mere serfs to the political-scientific complex and their immediate masters are the ‘science communicators’. Steve et al. ==> Correct — I have referred to this phenomena in the past as “Computational Hubris“. Thank you for adding the error bars to the satellite data. I am puzzled by the error bars in the tidal data. Does that include the errors, not just in measurement, but in the base point rising or falling due to the shifts in the land at each gage? Wayne ==> The error bars in the Tide Gauge data must be at least +/- 2 cm (centimeters, not millimeters), as that is the accuracy limit of modern Tide Gauge equipment. It is my opinion that an average cannot be more accurate than the original measurements. Older tide gauge data is less accurate than modern tide gauge data, so the error bars should be much greater than +/- 2 cm. Only a relatively few Tide Gauge stations are properly tied to Continuously Operating GPS reference Stations located on the same structure (CGPS@TG), and thus ONLY report Local Relative Sea Level — not actual sea surface height change. Remember, that’s what tide gauges were designed to do — measure and report local tides and water depth. It’s not just your opinion. Accuracy is a way of expressing data that was not collected or was lost. For example, when an analog value is digitized the smallest measurement that can be collected is represented by one bit. This also defines the maximum resolution of the data. So if a voltage is converted by a device that has a resolution of 0.1V per bit, then the minimum measurement is 0.1V and the accuracy (assuming perfect conversion) is +-0.1V. This means that if the real analog value is 0.14V, you will record 0.1V (one bit) and no amount of averaging will ever be able to recover that 0.04V difference. It is unknown and unknowable (lost) after the conversion. In this example your stated accuracy can never be better than +-0.1V, and it’s probably worse due to other factors like hardware limitations, etc. When the purported change in a quantity is right about the same as the error in measurement, maybe there might have actually been a change. Maybe. . . . It is a standard deviation of the data points, not the standard error of the mean. The number of data points is given in col 5 and is typically about 450,000. So, if they were independent, the standard error of the mean would be 0.14 mm. They probably aren’t independent, which would make it higher. There is always a clue here when someone claims very wide error bars. The error range is supposed to be one that is rarely, but not never, obtained. If your curve never gets anywhere near the error bars, the bars are probably wrong. That seemed obvious to me. My understanding of statistics says that if we take 10,000 measurements with an accuracy of ±10 inches its reasonable to quote the result to one tenth of an inch. Provided the measurements have no especial bias beyond random. Leo ==> That is true is you are measuring one unchanging thing multiple times. Yeah, that’s the problem, alright. Some sources of error, are random and uncorrelated; those you can shrink by taking multiple measurements. But one of the large potential sources of error in the satellite altimetry measurements is the uncertainty in the positions of the satellites, themselves. (If GRASP or E-GRASP ever flies, that might help matters.) That’s obviously a systematic error: if the satellite is actually a few cm higher or lower than you think it is for one measurement, it probably will be for the next measurement, too. That offset might “drift” over time, but the errors certainly won’t become independent. Additionally, the big revisions to Envisat, and the repeated revisions of Topex-Posiden and/or Jason measurements, apparently all reflected discovery and attempted correction of systematic errors. The tide gauges cut off in before 2010. Why is that Nick? Why is is the data that awful orange brown color? Is it to distract the eye from the altimeter data that kinda flattens out Nick? Causing one to focus on the uptick that the tide gauges end in? Seriously Nick? They didn’t have the tide gauge data for the last two years? Here’s the thing Nick. We shouldn’t have to depend on you to pull out the graph with the error bars and say “see, they did so calculate it, and its smaller than you think”. We should see error bars on EVERY graph, and truncated data in ugly orange is just as much bsh*t as not showing error bars. Thanks for the graphic Nick, very revealing. The IPCC shows results from published papers. These are from Nerem et al 2010. I expect that the satellite data, being automated, is regularly updated. I’m sorry you don’t like the colors. I didn’t choose them. All the sea level graphs in that part of the AR5 have error bars. If a satellite is flying around the globe taking measurements, they are not accumulating 10,000 data points of one value. They are taking 10,000 readings of 10,000 different values. The earth is not a perfect sphere, the satellite orbits are not perfectly spherical, they are not taking measurements with a laser beam so each signal is itself an average of sorts, plus there are waves and tides. And then they argue that sea level around the globe is not even the same so you can’t confidently average all the different measurements in the first place. It’s a fools errand. The tide gauges are fit for purpose, these satellite shenanigans are a joke. Tide Gauges are only fit for the purpose of determining Local relative Sea Level and its changes. funniest part is the new satellites are tuned to match the old satellites that were failing and were the reason for the new satellites in the first place…. Leo, you also have to be measuring the same thing. 10,000 measurements taken at 10,000 places around the earth would not qualify, even if you could prove that the errors were randomly distributed. Nick ==> Yes, curious that they would determine, here in AR5, a whole 8mm as the error in satellite-derived SL. That is, obviously less than a centimeter. Since even the most direct measurement of SL with acoustic tide gauges as a minimum error of +/- 2 cm — there is something hinky about their claimed 8mm. The measurement of SL by altimetery is still struggling to get to the accuracy of 2.5cm for individual readings – which then have to be corrected for a myriad confounders of unknown values. Thus, I must conclude that the 8mm is the same sort of non-science “my computer programs says…” “error bar” — entirely non-physical. You’ve just stated the problem. Error bars should appear on ALL graphs by default. I didn’t accuse you of picking out the colors, I merely pointed out the effect that color choice has. Very clever at changing the subject, aren’t you Nick? Why is that Nick? Why do you do that? Afraid to engage on the substance? Col 10 quite clearly is not the sd of the observed GMSL’s listed. Their whole range, systematic change included, is less than that. And if that were the population sd, it wouldn’t be different for each member of the population. But there is a simple answer to the folks who insist that the average can’t be more precise than the measurements (say 1°C). Observation. We calculate global averages, month after month. And they don’t vary with sd 1°C. Nick ==> Of Course , Column 10 is the SD of the individual numerical values that are used to determine the ONE Column 9 figure, (probably) calculated from the 300,000 or so weighted observations shown in column 5 for that one GMSL calculation. We will not discuss the precision of averages — you and I have discussed that one to death — and we will not agree. measuring one unchanging thing multiple times. yes. this error is made repeatedly. measure the height of 10 thousand people to the nearest 10 inches. will the average be within 1/10 of an inch? if so, then why bother measuring? just about every adult is within 10 inches of 5 feet 6 inches. so that should be the average height to 1/10 of an inch. Jason 1 and Jason 2 have a stated accuracy of 3.3 cm. This is after making statistical allowances for the daily multitudes of measurements between GPS satellites, and to DORIS ground stations, reflections from ocean waves commonly 100 times higher than the accuracy, daily ground surface elevation variations due to lunar effects of 10 times the stated accuracy, and the fact that the “ruler” itself in fact takes gigahertz worth of readings already….So believing that averaging a thousand printed output readings is going to increase the accuracy in a situation like this is actually a second year statistics student’s common error. Doug MacKenzie ==> Well, that’s what I understand as well. Clyde ==> Thanks for your input. Always welcome. No. If the accuracy is +-10in for a single measurement, then that’s what the accuracy is for the entire set. You can’t improve accuracy by averaging. Now, if what you meant was precision, then maybe you can reduce that by averaging, but the details are important. If the error distribution is not normal, then you have to account for that, which can be tricky depending on the model. You also need to make sure you are averaging measurements of the same thing, otherwise all bets are off. 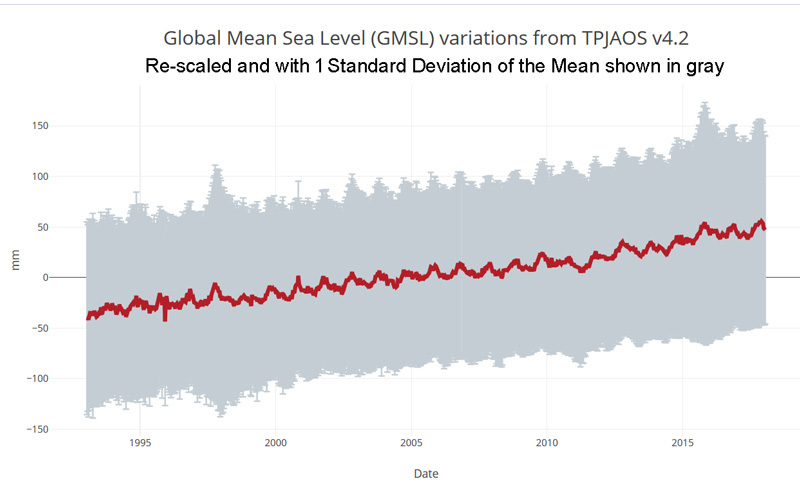 Standard deviation of global MEAN sea level. You think the chart is plotting individual datapoints rather than the mean?? I think they know enough not to refer to the standard deviation of a mean. Then are you suggesting that one SD of sea level as measured by satellite is 8mm? So measuring at the top of waves, swell and tides give a variance of 8mm for measurements from the mean when globally measured? I find that very difficult to believe. Then what exactly is “8mm” a measure of? Tim ==> The 8mm is a statistical artifact. KTM ==> Look at the data file — each data point in the chart is itself a derived GMSL in mm – a variation from some pre-determined mean sea level. The SD for that individual point is given next to it. The SDs are about 90mm — this means that the data points that go into that Mean (for the one point on the graph) are spread of data 180 mm wide — that’s about 7 inches. And that 180mm ignores all the uncertainty in the individual measurements (some 300,000 for each mean). the two. most misused words in English are “I think”. the true meaning is “I don’t know but am pretending I do”. The Radar Altimeters aren’t capable of resolving individual waves. What they actually do at the satellite is look at the the waveform returned from the uneven water surface and make something of a WAG at the mean surface height based on when the return starts to return and when it first peaks (sort of). If you think that’s inelegant and perhaps somewhat error-prone, you may have a point. In point of fact, errors due to different wave shapes might well contribute to the “seasonal” components of Mean Sea Level. reported by satellites. Tides are a somewhat different issue. 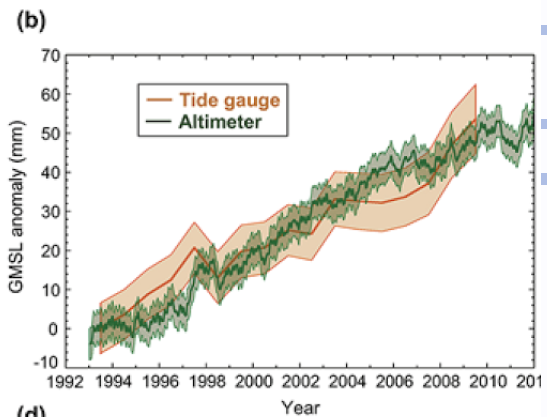 There are models that predict open ocean tides. How accurate are they? I haven’t the slightest idea. Suppose, as an example, after cutting the grass with a good mower, you decide to find out if the mower’s height setting is very accurate. You have a good quality metal ruler scaled in millimeters. You place it near a blade of grass to read off, then record, its height. Although the real world can be difficult and messy, let assume you can see things clearly enough to observe to the nearest mm. (#1)This makes the error +/- 0.5mm, no? There is some additional error in our measurement. Grass height is often subject to bending in slight air movements. That could even be effected by your breathing or slight body movement. How well the line of the ruler matches the vertical axis, right and left, of the grass blade is another possible error, as well as whether, for instance, there is some tilting of the ruler towards or away from your eye. Another error could arise from positioning of the ruler each time. Assume you measure, then pick up your recording notebook with the hand that holds the ruler, thus necessitating resetting the ruler for each measurement. Probably there are other sources of error. However, if you are diligently careful and manage to avoid psychological biases, observing then recording each effort without regard to what you measured any previous time, you should improve the accuracy by making, then averaging, some number of measurements. (#2) If you measure that blade of grass 100 times, the mean of those measurements should be significantly more accurate than any individual measurement, going well below the +/- 0.5mm, no? There may also be systematic errors such as parallax if the grass is too short to allow you to get your eye close enough to the ground to gaze completely parallel to the ruler mark. These errors don’t have a normal distribution but it may be possible to reduce them by some statistical means (if you can assign a metric to each). Now consider a different measure. Each measurement follows the same procedure as above but you measure 100 randomly chosen blades of grass (or 1000 blades, or 10,000 blades) one time each, to get an idea of the average lawn height. The 100 measurements of my first example would not zero in on the average grass height very well, as they all involve only one grass blade, but this series would. (#3) While you have made the same number of measurements, and exercised the same care with each, is there any logic that allows you to say the error of the average is in any way reduced below the error value of a single measurement? That is, if the error of a measurement is +/- 0.5 mm, can the average lawn height be any more accurate that +/- 0.5 mm (plus whatever other errors, such as bending by moving air, parallax, etc. that may be unavoidable)? Furthermore, wait two weeks and do the second set of measurements again, for 100 blades or whatever number of blades of grass measured in the second round above. Since it is quite difficult to keep track of 10,000 particular blades of grass in a lawn, this set of measurements will again be for randomly chosen blades. You can then calculate the average amount of total growth and the average amount of growth per day. Knowing various facts about grass growth, you might be able to estimate the amount of water used, the amount of sunshine received, the amount of CO@ removed from the atmosphere, or other quantities not measured directly. (3) Is there any way either average can be more accurate than the +/- 0.5 mm ruler precision, plus other accumulated errors? AndyHce ==> Averages cannot be said to be more accurate than the measurements that create the original data. It is possible, if one is taking multiple measurements of the same (unchanging) thing, to improve one’s accuracy by reducing the errors by division. This does not apply to multiple measurements of a changing thing at different times — nor to the madness of claiming it applies to the averaging of multiple measurements of multiple changing things at different times. In the last situation, you may get a better idea of the overall average, but only to the limited accuracy and uncertainty of the original measurements. You cannot reduce the error below +/- 0.5 mm when measuring 10,000 different blades of grass. The average will still have the +/- 0.5 mm error. Why? Each measurement of each blade of grass is independent of all the others. Averaging 10,000 independent measurements of 10,000 independent items will not reduce the error bars. Only measuring the same thing 10,000 times will let you average the measurements and claim reduced error. Kip, which is a more accurate measurement of daily temperature? 1) measuring Tmax and Tmin, and averaging the two……or 2) taking the average of 1440 temperature measurements at one minute intervals? David D ==> I is solely matter of definition since “Daily Temperature” is not a physical thing. Temperature is a transient measurement, constantly changing, and it doesn’t exist as a daily feature. There may be a “daily cumulative degrees” that may have physical meaning — and what we see as “Daily Temperature”, regardless of detailed definition, is, in my mind, a short-hand way of stating “daily cumulative degrees”. So it does apply, for example taking two measurements, say one at midnight and one at noon, versus 1440 at one minute intervals. The average of the 1440 is more accurate that the two separated by 12 hours. The process is similar to how one measures the area under a curve. The intervals are made smaller, and you take more and more of them to reach the answer as a limit. Once you get the area, you can then calculate the “average” value of all the values on the curve. David ==> Well, of course “the average” can exist — but does it represent either Minimal Climatically Important Difference? or even a Minimal Biologically Important Difference? Is it PHYSICALLY important in any way or is it just mathematically or statistically interesting? In your “area under the curve” example, the area actually exists in some weird 2-dimensional world, which is where the example works. The idea of “daily cumulative degrees”, as a metric, is closer to the “area under the curve” idea. If calculated in Kelvin it might actually be a meaningful metric — physically and biologically. David ==> Really, we mustn’t conflate pragmatic choices of wardrobe with scientific ideas. In fact, when I was at IBM Corporate HQ, I dressed for the “a bit too cold” temp in the lab. When at sea, I dressed, not for temperature, but for wind chill. When I roamed the Dominican Republic on humanitarian work, I dressed for both “always way too hot” and social appearances. Note as well, that in the real world, you do NOT dress for the Daily Average — one dresses for the range of temperature expected for the time you will be exposed to outside temperatures. The daily average will have you dressing too warmly, as it is decidedly cooler (usually) at night. Yes, automatic fuel oil delivery is predicated on the measured degree days for their local/customer base. ” some weird 2-dimensional world,? Did you skip all your calculus classes, or did you not take them? PS: “Minimal Climatically Important Difference” and “Minimal Biologically Important Difference” are not relevant to this discussion. But then regional climatic averages are directly related to the species mix for that region if that’s what you are talking about. David ==> This discussion is not about oil delivery — I’m just glad I don’t have to depend on my oil company to get that right — too many variables not being measured to taken into account. But at least “heating degree days” tells us something….as does the metric “cooling degree days” — average daily temperature not so much. MCID and MBID are hugely important concepts — and the ONLY THINGS that really matter in climate science. All the rest is just interesting. Kip says: “But at least “heating degree days” tells us something….as does the metric “cooling degree days” — average daily temperature not so much. David ==> Ironic, isn’t it. The days “average temperature” by any definition and to any vague accuracy, lends itself to a quick and dirty rough calculation of “heating degree days”. All this has to do with the unphysicality of “daily average temperature”…. one an calculate it — but it may not mean what we might think and may not be useful. “Arctic” annual temperature is the same way…..for many things, it doesn’t particularly matter if the winters are truly dangerously cold, or only really really cold. It does matter how long the season is when it is above freezing and how far above for how long. Annual average hides all that important information. if ADT<65, 65-ADT="heating degree days"
The grass would grow by more than that in a short while. Another thing it is useful for is calculating the monthly and yearly average(s). If you get 30 years worth of data, you can then use the accumulated 30-year average(s) to calculate anomalies, then trends. David ==> well, only if you feel that those [incorrect] metrics themselves might be useful for something. As demonstrated with the Daily Average Temperatures, that is in serious scientific doubt. David ==> Like the stock market reports, “ten degrees below normal”/”up ten points” are not very useful pieces of information for the general public. “general public” maybe not, but NYSE floor traders find it indispensable. Ten degrees below normal would be very valuable information for the highway maintenance crews that have to deal with patches of black ice on the roadways. David ==> Are you just trolling here? Ten degrees below normal means nothing to the Hiway Dept in the summer — ten degrees downward is ONLY important if that ten degrees crossing the freezing line. Then it is physically important…..which is what I’m talking about. When some data might be important physically — in the world that operates by the laws of physics. (like the temperature at which water freezes). Taking 1440 readings of the same location using the same equipment increases your nyquist sampling rate which means you have a better chance of figuring out what the wave form actually is. On the other hand taking 1440 measurements of different stations using different equipment doesn’t improve your accuracy at all. David, it only gives you a “trend” for that one spot. Trying to average the “trends” of many spots together does not increase your accuracy. Thank you very much Kip. You have proved my point. Road crews and their management are very much aware of daily average temperatures, and their 30 year averages. David ==> Road crews don’t care a hoot about daily temperature averages — they do care about freezing and thawing (neither of which is a factor of daily average temperature). And when you average the trend for thousands/ tens of thousands of spots, your end up with THE global trend. David ==> Which place has more enthalpy, San Francisco @ 50 degrees and 99% humidity or Death Valley @ 50 degrees and 0% humidity. The global climate may be changing but using an average global temperature really doesn’t tell you anything. Some places may have rising temperature but falling humidity, some may have lower temperature but higher humidity, some may have rising temperature and humidity, others may have falling temperature and humidity. You need to know these things in order to accurately assess the effects of climate change on different parts of the globe and the resulting effects on fora and fauna. Average Global Temperature really tells you nothing. Neither do research papers who take a global temperature and try to assess local effects by using it. The point is that we don’t know whether or not the actual sea level rise is approaching the “error bars” or not because we can’t measure it accurately enough to tell. MarkW ==> Oddly enough, that is exactly correct. 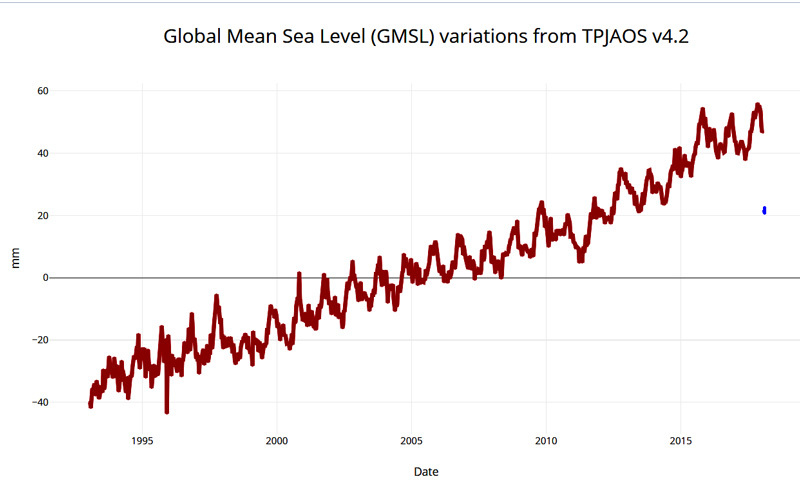 We can not measure it accurately/precisely enough to know if the derived GMSL (from sat data) trend represents an actual rise in the height of the sea surface about the geoid. In fact, the figures given in the text file for satellite GMSL are not intended to be a measure of sea surface height or its changes, but are a metric of something slightly, but significantly, different. CGPS@TG (same structure) data, when we have enough of it from sufficient locations well spread around the world, will give us the start of a data set that, given enough time, will allow us to determine if the sea surface it rising and how much. Nick ==> I only report that it is not clear which SD they mean .. I quote their column heading. Until I have a better reference — we just don’t know. If you can point us to a reference that clears up this point, I would appreciate it. As it stands, we only have the column heading to guide us. It states (this is a “copy-and-paste”) “standard deviation of GMSL (GIA applied) variation estimate (mm)”. 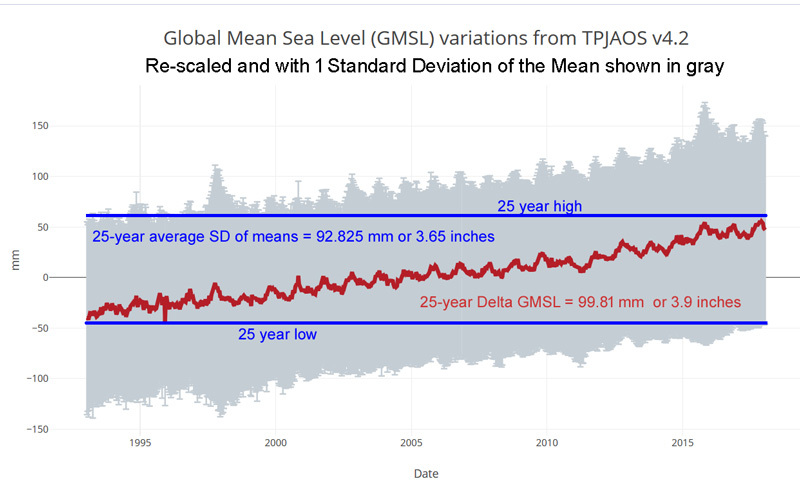 Since the column heading could be written out as ““standard deviation of global mean sea level (GIA applied) variation estimate (mm)”, it is possible that they intend this to be the SD of the mean, though I really don’t know, and without a reference, but I too suspect that based on the numerical value, they are referring to the variance in the data that is used to calculate the individual means (which are the data points of the GMSL graph). I’m not sure why you have interpreted my saying precisely what you say as being “wrong”. You quote me correctly “The standard deviation of the individual Global Means is very consistent and averages around 92 mm.” The grey whiskers are the SDs of the individual calculated means, one different SD for each data point of GMSL. In the end, the data is what it is. Nick, Kip and others: If you look at the dates associated with each “sea level measurement”, you will see that they are 10 days apart. Satellites record data continuous underneath the track of the satellite, whether it is high tide or low tide at any location. I don’t know whether the satellite passes over every spot on the planet once per “ten-day data point” (unlikely) or multiple times per 10-day data point (more likely) or even multiple times per day. So each data point is an average of about 1/3 of one million discreet measurements that contribute to one measurement of GMSL. Since tides and other factors effect measurements made over those 10 days, GMSL is being determined to +/-10 cm in every 10 day period. Given the size of tides and atmospheric pressure, this doesn’t seem unreasonable. However, we don’t care about Sea Level itself, we care about Sea Level RISE! The error in SLR is the only relevant error. 2.8 mm/yr * 25 years = 70 mm = 7 cm. So, satellites claim to have measured 7 cm of rise over a quarter century using absolute sea level heights with 10 cm uncertainty over any 10 day period. In truth, however, when we determine RATE from a linear regression (or quadratic regression) we always ignore the vertical error bars on each data point. We allow the vertical scatter in the data to inform us about the uncertainty in the SLOPE, not the error bar attached to each data point. Having personally tried to analyze SL data to detect acceleration, I can tell us that there is a tremendous amount of lag_1 autocorrelation in the data. When I applied the Quenoille correction, IIRC, I was left with just 18 independent measurements made over 25 years. That would be about 50 ten day periods being averaged into one data point. SQRT(50) is about 7, which would bring the vertical error bar for each data point down to about 1 cm. So picture a graph 18 data points over 25 years with 1 cm vertical error bars. Drawing a best fit line through those points. Mathematically, the slope and confidence interval turns out to be 2.8 +/- 0.4 cm/decade. As best this skeptic can tell, this isn’t an unreasonable answer. Nick, Kip and others: We can also look at the data in a different way. According to the data base, there are 1/3 million individual data points taken in any 10-day period and almost 1000 10-day periods. 1/3 of a billion discrete measurements to plot on your graph before doing a regression. Those discrete measurements have no statistical uncertainty, just uncertainty that arises from systematic error that can’t be quantified. With satellite data, the possibility of systematic error is a far bigger problem that statistical uncertainty. Satellites take a huge number of measurements, so statistical uncertainty isn’t a huge problem. The huge problem is the possibility of systematic error (that can’t be quantified). Variations in humidity in the troposphere, the state of the ionosphere, ocean waves, and other factors require corrections of METERS in the distance from the satellite to the sea surface. If any bias develops with time in the observations needed to make these corrections, that will bias the derived rate of SLR. The same data set has been reprocessed many times, especially the earliest period, and produced very different estimates of SLR. Then there is the problem of satellite orbits that drift more than 1 cm/yr. This means that we can’t measure SLR directly from space. Satellite altitude is determined measuring the distance down to various calibration sites that are being monitored with tide gauges and corrected for vertical land motion. If the GPS corrections for vertical land motion at calibration sites are used, the average rate of SLR over the last 25 years is 2.4 mm/yr. If a model for VLM is used, 2.8 mm/yr. There have been several large revisions made to correct systematic error. Morner complains about those corrects without bothering to listen to the rational for them. Frank ==> It is not the “rational” that matters — it is the reliability and accuracy of measurements and their corrections and adjustments. Read my Sea Level series (linked in the essay) or Judith Curry’s about satellite SLR. Confounders are HUGE and corrections and adjustments for them are vague guesses with huge error ranges. Oddly enough, that’s exactly what it does — by intent. Without going into details, the ground trace of the satellite moves Eastward by a fixed amount with every crossing of the equator by the satellite. Things are arrange such that the ground trace repeats “exactly” every ten days. The question of standard deviation is effectively meaningless when attempting to define the accuracy of data. Accuracy is a physical characteristic of the raw data, dependent upon instrumentation and sampling method. Standard deviation may be interesting by itself but it merely describes the scattering of the data, not its accuracy. 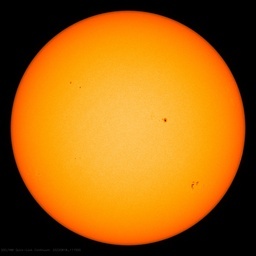 Data with high scattering may be quite accurate and data with low scattering may have been collected with poor instrumentation or sampling method. Standard deviation will never provide an accuracy number. If we used the “standard meter” as an object to measure, then adjudicated the accuracy of our measuring equipment and method when applied to the standard, we could evaluate the accuracy. If we believe we are measuring a constant characteristic, such as “length” or “height”, then huge variance in out measurements (large SD) tells us something important about our measuring stick and results. When measuring or calculating an unknown, however, such as instantaneous sea level at any set point and time, a transient constantly changing quantity, we have more difficulty, as is demonstrated even in simple Mean Relative Sea Level as determines by acoustic tide gauge. Yours is an interesting spin but a bit off target for this discussion. In your example of measuring the “standard meter”, you are not measuring the “standard meter.” You are checking the calibration of your measurement stick against the known accuracy of the “standard meter.” The data you gather from that exercise will provide information about the resolution, accuracy, and expected value noise of your measurement stick. You can have some confidence that using your measuring stick may provide that level of accuracy and repeatability. Provided the scatter of the measured values turns out to be normal, the precision of your measurements might be improved by averaging a number of measurements – with a number of caveats. Of course, you would still be left with the base resolution and accuracy of your measurement stick. Now, let’s move on to a situation where you are not measuring a precision international standard. You can assign an accuracy value (+/- n mm or whatever) based upon your measurement stick calibration process and have an expectation that a SD greater than that of your measuring stick alone may be do to scatter in actual measured quantity. Of course, now you have lost your normal distribution claim because you have not verified normal distribution of the actual measured quantity scatter mixed into your data. Your data accuracy is still limited to the accuracy of your measurement stick. Now, let’s move on to measuring sea level. 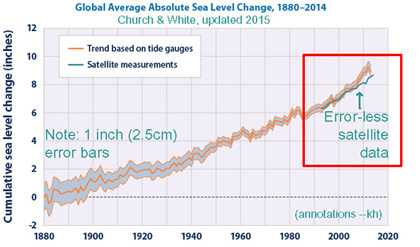 As you say in your third paragraph, sea level is a moving target. Additionally, our acoustic tide gauges are moving. Even the speed of sound in the acoustic tube is variable depending upon air pressure, temperature, and humidity. With any sea level measurement technique, there will be errors that may or may not average out over time. Each instrument type has been engineered to specific accuracy values. Those values should be stated when using collected data. The issue at hand, however, is whether judgement can reasonably be made about the accuracy of a set of instrument readings based upon the Standard Deviation value of that data. Mid latitude tide gauges show large diurnal changes. Does that mean those sea level gauges are less accurate than those at equatorial locations? Of course not. Standard Deviation can provide information about expected ranges of tides, not how accurate an averaged value might be. Gary ==> Were it only that we were interested in measuring tides — but they are interested in measuring sea surface height and its changes. They have no standard to determine the accuracy of their resultant calculation of sea surface height — no way to tell how accurate their result is. Thus the method and equipment/technology leaves them with a large uncertainty, which is almost entirely ignored when they publish results or derive trends. If the measurement accuracy was to be quoted, the trivial rates described would not impress anyone. Those rates may be real but their data does not actually prove them. In industry, you install instruments three times or more more accurate than the trend you are expecting in a given measurement time frame. Unfortunately the climate research folks are having to deal with data with much too little accuracy to answer the questions they are asking. A whole lot of wishful thinking seems to have gone into the statistical machinations used in an attempt to divine information from that data. Gary Wescom ==> Ah, there we are. My own humble opinion is that if indeed global temperature increase and eustatic sea level rise are being exaggerated then the bigger the hole guilty parties will eventually have to climb out of as time passes. It is reassuring to know that truth cannot be hidden for ever. They may right, in which case I take my hat off to them. However I see no need to buy this hat for some time yet. Dr.Murray Salby who has a BSc in aerospace engineering and a PhD in environmental dynamics has been giving presentations for the last 2 years that destroys the global warming hoax in 10 different ways. After his 1st presentation he was fired from his Australian University. Does anyone know what he is doing now or if he has caught in with some other organization? Indeed I have been wondering this myself. I watched his latest (?) 2016 presentation in London. I really would like to see some back-and-forth argumentation about this issue as well – not that falsification of the climate catastrophe claim depends entirely on this – but I am curious. There is some alleged “debunking” going on at the alarmist websites, but I have not taken the time to assess it’s validity yet. I guess it is very unfortunate that access to his data was blocked by the university, so that a publication with reference to the actual data and sources is hard to do. The reasoning of his analysis seemed very legit anyway (apart from a graph where I doubted his claim to 200% increase in accumulated anthropogenic emission after 2002, because of scale truncation). So indeed – who knows what he is up to? Dr. Salby has made several grievous errors. Moreover his three presentations available on Youtube are internally inconsistent. This has been hashed out here before. Judith Curry and I were going to do a Debunk Salby post at Climate Etc, but then decided the errors were somobvious it wasn’t worth the effort. Willis some years ago took apart the first part of the first presentation here, then likewise threw up his hands and quit. Because Witch Doctors are always certain about their claims. They don’t need no ‘steenking’ error bars. Kip: As I interpret the data table I think the SD shown is derived from the ~ 340,000 observations (weighted) shown in column 4. Obviously if you divide the SD by the square root of ‘n’ you get a quite small standard error of the mean – about 0.17mm. That would add +/- 0.34 mm (2 sigma) to the mean to get to the 95% confidence interval. The ~ 100 mm SD would indicate that about 95% of the observations should be within +/- 200 mm of the mean. By the way, I agree that dividing by the square root of n is only valid if the errors are random and the sampling process is unbiased. But this does not account for the uncertainty inherent in each individual observation. I think that the measurement uncertainty is substantially larger. Given the extensive data processing that must be required to convert raw satellite measurement data to sea level, I would expect a rigorous evaluation of MU might well produce error bars that would make it very difficult to conclude much about the rate of SLR with any real confidence. Perhaps NOAA/NASA has published such an uncertainty analysis? If not, they should. Since there seems to be quite a significant difference in SLR measurements between the satellite and tide gauge data, I would tend to trust the tide gauges more simply because the data analysis seems more straight forward. Rick ==> Yes, I came down on the side of just plain SDs of the measurements that go into one data point of GMSL that makes up the data set — based on the numerical value. The obvious point is that the variation in the data that makes up each data point is HUGE compared of the delta of the metric being derived. In fact, the SD of individual points is equivalent to the total 25-year delta of the metric. That does not give me a lot of confidence in the significance of the data set as a whole, at least as far as the direction and magnitude of the change. There is zero added value from attempting to measure sea level by satellite. Sea level matters at the coast, measure at the coast where it matters. The tide gauges are better in every way. They are more precise, they have longer records, they are more relevant to their surroundings. When an alarmist wants you to pay attention to the satellite sea level data but ignore the satellite temperature data, you know they are quacks. Measurements from land are contaminated by changes in elevation of the land. Measurements of what are contaminated? A global ‘average’ with zero value? Sea level matters at the coast, where land movement also matters. Relative sea level matters, absolute sea level after making a dozen different non-physical adjustments is a pointless abstraction. Measurements of sea level changes, of course. That’s what the article is about and what your post that I’m replying to was about. The perceived advantage of satellite sea level measurement is that it is possible to survey most of the ocean surface, not just the coasts. And further all of the measurements are made with the same instrument(s) so it isn’t necessary to worry about the peculiarities of individual instruments. Unfortunately, there are roughly a gazillion problems with satellite measurements of miniscule changes. There was a handy book published some years ago that readers of this forum might find useful. It’s called How to to Lie With Statistics. Not sure if it’s still in print, but it should be available second hand. To avoid the simple truth: the information is in the errors. I see you have a three part series on the Law of Averages. Awesome! I shall look forward to reading those. I’m interested because I’m half Scottish and half French, so I think that averages out to English. This is an observation that leads me to confusion about minuscule sea level rise ‘measurements’. I live on the western edge of a very large salt water lake on the east coast of Australia. There is a very narrow connection to the ocean through which the tidal water flows. The lake is so large that it buffers these tidal movements so that where I live about 7 km opposite the channel there is no tidal effect. However there is a very large atmospheric effect to the extent that water levels vary almost half a meter vertically depending on conditions. This is quite obvious with large areas of rocky reef exposed at low times and well covered at high times. Collin ==> Can you say where this is and give long-lat coordinates? Kip, it is Lake Macquarie, Google Maps will find it for you. I have had it confirmed that there is no tidal influence by Manly Hydrology Lab http://new.mhl.nsw.gov.au/ Happy for you to contact me offline if you need more info. Cheers. ColinD ==> Thanks, Colin. appreciate it. I have an infrared spectrometer I use to study minerals. I sum about 125 scans to reduce noise. However, the inherent signal quality rules and rough specimens can create spikes for a single scan that is hard to smooth out. If a spike is at infinity (roughly +- 32,000 in the machine where minerals have values from o to 100), then no amount of scan summations will remove it. 125 scans do reduce noise, perhaps a third of it. It does not cancel out all noise. The quality of the signal is the signal to noise ratio not the summation value. Donald ==> And you are measuring one single unchanging thing — you multiple measurements should, if your instrument is not systemically biased, give you a far better idea of composition than a single measurement. But, as you say, if the measurements are all over the map, regardless of the precision of your “average”, the variance of the data suggests a great deal of uncertainty in that average, regardless of its precision. About 175 years ago, a Charleston mayor offered up a $100 gold medal to anyone who could solve the small coastal city’s flooding problems. Just because sea level is rising by some amount does NOT prove the rise is primarily due to fossil fuel combustion. Sea level was rising long before humanity burned large volumes of fossil fuels, which only accelerated circa 1940. Sea level has been rising for about twenty thousand years, since the peak of the last major Ice Age. Politicians lying in order to get money. Something that has never happened in the history of the world. Two of the Fiji Islands have actually gained in area, as shown on an aerial survey. Because Fiji is hit by cyclones is no proof of anything except that Fiji is hit by cyclones. In the US Northeast they say that the dearth of snow is proof that global warming is happening, yet they overlook the fact that before 1950 and into the 1800s there are numerous examples of “brown” winters and of spells of “unusual” and “unprecedented warmth” in winter– these are the descriptors that are actually used if you research historical news accounts. This year was a good one for snow in the NE. AGW is the biggest scientific fraud ever. Difficult medicine for true believers to swallow when they subsist on a steady diet of massive and unrelenting PR. Some areas like Fiji are experiencing land subsidence. Many cities are sinking due to groundwater pumping. But AGW folks blame climatechange for all these and spread fear of drowning from SLR. So the lying politician doesn’t mention subsidence, and that proves the land isn’t subsiding. As always ivanski sees only what he is paid to see. Are you suggesting a politician would never make stuff up to get money for his constituents? This trolls tunnel vision is amazing. There is no mention of asking for money in this one article, and that proves the politician isn’t doing it for money. You would be funny, if you weren’t so pathetic. Regular yes. Reader, I am yet to be convinced. The article you linked says nothing about sea level rise impacting Fiji. It says that cyclones are dramatically increasing in frequency, which is contradicted by a mountain of data. Oops, another troll that doesn’t bother to actually read the articles he cites. ivan ==> Generally, BBC television programs are not considered scientific references — here or anywhere else. You might want to consider your sources. The posts I referenced near the beginning of the essay are filled with references to IPCC , NOAA., NASA, and more recent findings on Sea Level that you could read to bring to up to speed. You don’t seem to understand the position you are taking, or the position I and others here are taking. No one doubts that Sea Levels are rising (sea surface height, really). It is the magnitude, rate and causes that are under discussion. Climate Warrior talking points, from, the BBC or elsewhere, are worthless here. KTM, I was referring to ivanski, not you. Sorry for being imprecise in my language. As always, ivanski prefers the propaganda site over real world data. This is real world data … It is REAL not fake. Do you like playing the fool? ivan ==> Did you look at Morner’s 2017 paper I linked for you? Fascinating. Anything printed on ivanski’s propaganda site is factual data. No disagreement permitted comrades. ivan ==> You have peaked my interest — I have written about many local Sea Level Rise issues — and may take up Fiji as the focus of an essay. In the meantime, you might like to look at Morner’s latest paper. So when did natural SLR end and manmade begin? SL rose more than 100 meters before the first fossil fuel was burned. Not the point. Eons ago there were no huge metropolises on the coast. Now there are plenty and SLR is a huge threat. There have been huge metropolises on the coast for thousands of years. Many are now high and dry, due to MSL having fallen since the balmiest intervals of the Minoan, Roman and Medieval Warm Periods. ivanski, nice attempt to change the subject. More proof that even you know you can’t defend the nonsense you spew. Yes each INDIVIDUAL POINT has a large uncertainty. Both systematic and random. But when you have a large collection of such points (as here), that loses its importance. The uncertainty of an individual point can be high, but the trend of a large number of such points is still highly significant. For an example, consider average lifespan over the past few decades. In every year there will be a large spread of lifespans (the SD is high) and the “error bars” (standard deviations) on each point will overlap with other points. Yet the trend towards longer average lifespan is still statistically significant. I think this is not a good analogy. The individual lifespan is known to a degree of accuracy of say one day, date of death minus date of birth. What would the estimate of error be if we only knew the month or year of these dates? Roger, I don’t think decreasing the resolution of measurement by a small amount would have much effect on the standard deviation (provided that the resolution is still small compared to the standard deviation). The majority of people live to say somewhere between 55 and 95. The average for the sake of argument may 80. This is a guesstimate but the range is large. The standard deviation is large, I would guess about ten years. So a month error on each point does not increase this much. it certainly would have little effect on the statistical significance of the trend line slope. This is worked out from the observed scatter on the points, not the uncertainties on individual points. Back in the day, say life expectancy was 75 plus or minus 20 (assuming 95% confidence is about 2 SD’s). Now it is 80 plus or minus 20. The error bars overlap A LOT but the confidence that the average has increased is still very high. KZB ==> There is a point to be made here, – in both directions. In the case of SLR, the delta of individual sequential means is about 3% of the SD…even if the data is good to about 95%, they means cannot be said to certainly even be different. since no attempt is made to quantify the actual physical error range –values this close can be considered the same. In the long term trend — we have 25 years of change, the magnitude of which does not amount to more than 50% of the SDs of the individual means….thus the very small trend may well be an artifact of the derivation process rather than a physical change or may be a systemic error in the mechanics of data gathering. The way to check this is to compare the Satellite-derived data to the Tide Gauge data from the network of side-checked (verified) CGPS@TD stations around the world. When this is done, tide gauge data shows about 1.7/1.8 mm/year, which is only about 2/3rds of the satellite trend. If the error is systematic, then no number of readings will reduce it. Being random only matters if the randomness is evenly distributed. Agreed, if there is a systematic error that changes with time it will give us a spurious slope. But also bear in mind if you have a constant error on each point, an offset, it does not affect our slope calculation one bit. KZB ==> In this situation, we are talking of the individual points of GMSL (which are about ten days apart or so) which are calculated from data which itself is highly uncertain. In you example, it would be the inability to know how long each person actually lived — maybe 30 years, maybe 60 years, maybe one day — and then averaging the uncertain individual’s data to get a national average that shows an increase over 25 years of one year. There is no way to overcome huge uncertainty in individual measurements. I’m not arguing that a large scatter has no effect. Obviously it reduces the confidence level that any observed trend is statistically significant. What I am saying is that the SD of each point (which is a mean) is taken into account in this calculation. In its simplest form you do not use the uncertainty on individual points. Waheed Uddin’s comments for Kip. Mean Sea Level (MSL) is established for specific country or region using historically measured data at given locations for the purpose of creating topographic maps. That MSL includes the effect of day and night and monthly seasonal variations. The real SLR data should be the deviation from MSL. Mean SLR by satellite seems to be an overall average of all the scanned locations on the globe for the related period of reporting. What universal MSL is used to calculate Mean SLR is not clear? In any event the NOAA satellite data averages out the spatial MSL values, the day and night tide variations, and the seasonal monthly variations. The reported mean SLR plots should have a big standard deviation but it is hidden in the raw data only. Standard Error of the Sample Means (SEM) is a smaller number compared to Standard Deviation (SD) of the mean of each year for the entire 25 year data. The SD plot should show higher variations because it is related to each time of data points for all spatial locations on the Earth. Or does it relate to seasonal (monthly) variations at all locations in a given year? Not clear. Another question to ask if the data is normally distributed and if the variance (square of SD) is changing with time? If normality is not there and if variance is changing then t test is invalid too. However, data following any type of distribution can be divided into sample subsets and the distribution of these sample means follows normal distribution. Its standard deviation is computed as Standard Error of Mean or SEM. I propose that NOAA should divide the data in 5 year data subsets to calculate 5year Mean SLR and SD instead of using 25 year mean. That will provide 5 sample subsets. Now ANOVA statistical test can be used to find out if the difference in the sample means of these five subsets are statistically significant. It will also provide a more rational method to determine the increase and decrease in Mean SLR over time. I saw the same average of averages used by NOAA and NASA to smooth out variations in reporting global mean annual temperature anomaly time series. It is cheating with smoothed out data and not science modeling. Our ANOVA for three distinct periods of NOAA GHCN global temperature series between 1950 and 2015 showed no statistically significant difference in the means of the three periods. NOAA and NASA have been claiming increase in temperature anomaly only to fit with their AGW narrative. Waheed Uddin ==> NOAA/NASA uses a standardized geoid and measures SL in relation to that. Their real problem is that the original measurements are subject to HUGE confounders whose true values are only guessed at. Then, as you say, the are Averaging Averages! Conceptually when measuring sea level change, it doesn’t matter (within reason) what the reference is — so long as it is constant..
Don K ==> True — they change the reference geoid occasionally. As we are “measuring” sea level to one digit millimeters, it might matter in the short term. We can’t know how accurate the geoid is either, not on mm scale….but if they hold it steady, at each point, then it might do. In the above posted article, the trend appears to be linear with summer to winter high and lows. In reality ocean temperature presents cyclic variation and year to year variations are very high. All these have no role to play on sea level trend? Or all these are smoothed out to show linear trend. In nature it is hypocrisy??? Well see my example on average life expectancy above. Statistics is all about detecting a signal in the noise. If this is hypocrisy then 99% of ALL science is hypocrisy. Statistics “can” be used to find a signal in the noise. It can also be used to “find” signals that never existed. It’s all in which statistics you choose to use. Mann’s statistics were capable of finding hockey stick shapes even in random noise. Yes statistics can be misused as well, damn lies and all that. Which is why it is our duty to point out when they are being used wrongly as in this article. In the end these articles do not do your cause any favours, because they give the other side reason to laugh. James Hansen (the godfather of man-made climate change “science”) looked at the sea level data in the 1980’s and concluded that much of Manhattan would be under a few feet of water by 2050. His error bars must have been broken at the time, or maybe he was just trying to scare us. Kip- I agree with you that more needs to be done to highlight the importance of sea levels. I personally have an opinion that sea levels are rising due to uneven level of light rays reflecting on the surface of the water, in order to warm the surface and help the evaporation process. Which in turn is having an effect on crop growth. Javad Sheikh ==> There are certainly seasonal cycles apparent in the NOAA SL graph….the more often shown graph has these signals removed. to “measure” global sea level rise (Change) to an accuracy of 2.8mm (+/- 0.4mm/year) via satellite? Complete bullcrap! Perhaps more like. Some uncertainty can be reduced by repeated measurement. That means that your uncertainties are likely to be dominated by those that can not (easily) be reduced by repeated measurements. Once it is understood that you are measuring a distribution, it becomes clear how badly errors are dealt with in Climate Science(tm). The “signal” from global warming probably disappears with correct handling of errors. Thank you. That is the point I was trying to make above. I think that you did a better job than I did. Yes you are looking at it the right way, up to a point. But now extend your thought experiment to plotting those mean temperatures over 100 years. It will be possible to fit a best line with a certain slope. The uncertainty of the slope can be calculated and also whether it is significantly different to zero at a given confidence level. The random variation will be contained in the scatter of the points. The uncertainty (standard deviation) on an individual point does not enter into the calculation. Yes, more sophisticated calcs can weight the points inversely with their uncertainty, but if all the uncertainties are similar (which they would be in your experiment) this would have little effect. Not clear as to the relevance of Ivan Kinsman’s commentary in a discussion about sea-level rise – his link is to a statement about tropical cyclones. If low lying countries are suffering as a result of sea level rise (contrary to the findings of Morner), perhaps he or someone else could name me three such countries which have lost 10% or more of their habitable land-mass to SLR in the last forty years – with scientific references, not links to politicians’ statements, please. John Cherry ==> Ivan may just be playing Jr. Climate Warrior — not really trying to discuss anything. I could be mistaken but that the averaging of measurements, under the same conditions, of one single thing, can get closer to the “real” value, seems straightforward and understandable in term of human actions and human senses. That errors across measurement of different items, events, etc. can not be averaged out also seems reasonable to me but might involve some more subtle factors of which I am unaware. In the case of measuring a single thing under identical conditions, the precision is increased through averaging multiple measurements No? In other cases, for example determining the average height of adult females in the US population, could be more accurately estimated from a large, random sample – but the precision of that calculation would still be the precision with which a single individual’s height can be measured. Correct? Willie Soon gave this lecture on satellite altimeter measurements of sea level. He claims that the maximum resolution of the microwave frequency used in 5 centimeters; I’m thinking that means +/- 2.5 cm. He lists a number of other unavoidable errors, that largest of which he says is 10 cm. Somewhere recently I read that the official user’s manual for the satellite data says the error is, I believe, +/- 3.4 cm. Perhaps that was in one of Kip’s recent articles. Assuming that these figures are correct, and even without any of the other objections raised by Soon, Kip, or others, can any champion of the satellite sea level data justify, and explain that justification is real terms, that any claim from the satellite data that there is any change in sea level, either up or down, does not need to be based on the change in calculated average being more than 3.4 cm different from the first good measurements? About the satellite measurements, we need to know how much of the uncertainty is systematic and how much is random. If you use the same instrument in the same situation for all measurements in the data set this systematic component can be more or less discounted. All you are after is the trendline, not the absolute values. KZB ==> All the factors that answer that question are highly uncertain. Ken ==> And does it matter for anything? or is it just interesting? Is it something new? or has it happened before? Lots of interesting questions — some of them have interesting answers. The bulge will decrease, but I doubt we have any instruments that are capable of measuring the change. Wouldn’t a thousand pictures be worth a million words? I mean, where are all the pictures for evidence of sea level rise around the globe over the past 100 years. There should be millions of them actually. DR ==> Sure! and you’d think that if they had pictures, they’d just post them for all to see. Trouble is, it is easy to find places where we are pretty sure that the sea was prehistorically a hundred feet higher than today, and see places that are now underwater that used to be on the seashore. 8-12 inches ago (say a hundred to 150 years) — not so much. It is only since the GPS satellite system went up that we can tell if the land is sinking or the sea rising (or vice versa). Give us another 20 years and we’ll have it figured out. There is one extremely clear indication that the trend is robust and that using 1 standard deviation as any sort of measure is spread is highly suspect — the clear annual oscillation. If the uncertainly was indeed ~ 100 mm as your diagram implies, then the annual signal would be lost. The fact that the annual signal shows up load and clear suggests that the measurements can indeed pick up variations on the order of a few mm. Tim ==> Such oscillations can easily be artifacts of processing, orbital features, seasonal features of the atmosphere (air pressure) or the seas that have nothing to do with sea surface height. TJ ==> They are NOT error bars — they simply represent the +/- one Standard Deviation, with the SD provided by JPL/NASA. There’s clearly a lot of statistical expertise available from certain contributors on here. What a pity these persons are not asked to review articles before they get posted ! TJ ==> Read William Briggs Uncertainty. Just because they are able to derive some sort slope out of out of very vague, very very numerically uncertain data doesn’t mean that the “detected” slope 1) is Physically Real, 2) is Accurate or Precise, 3) Isn’t just an artifact of the processing method, 4) Isn’t an artifact of the equipment used to ‘measure”. All of those certainly apply to the unmeasurably small delta in SSH. Statistics do not create reality — they are simply a way to investigate some number set. Statistics do not necessarily reflect the physical world, despite following its careful rules regarding numbers. Statistics cannot and do not eliminate ignored physical measurement errors orders of magnitude greater than the magnitude of the thing being measured. Without a very in depth look at the processing method, it is impossible to say if the very-near-zero delta in sea surface height is REAL — it requires external verification. I’m sure they have their math right — I’m do know that the “corrections” and “adjustments” made to the to satellite signals measured deal with factors, confounders, that are multiple orders of magnitude greater then the sea surface height change signal they are looking for, and that those corrections and adjustments are rough guesses of unknown and unknowable elements. Well said, especially about ignoring physical measurement uncertainties! Kip -that might be fair enough if you hadn’t based your article on statistical arguments in the first place. Your points about corrections and adjustments may have real value, but it wasn’t what took my attention. When you say statistics cannot eliminate ignored physical measurement errors, well that depends on the nature of the “ignored” errors. If they are random errors then yes a signal can still be extracted from the data. KZB ==> I just used the data supplied by JPL/NASA, which, in place of physically-based error bars concerning measurement uncertainty they supplied simply the Standard Deviation of the 300,000 or so individual calculated guesses at sea surface height used to calculate a Global average sea surface height, from which they calculate an anomaly……. KZB ==> Take the time to investigate the number of steps and the processing path between the original satellite measurement, which is of a return time of a KU band signal, which hits the earth over a km wide area and bounces back, and a scatter factor, which is used to estimate the sea surface conditions. From those two numerical values, they have to try and determine the average sea surface height of the area off of which the signal bounced. The sea surface may be smooth to within centimeters — but NEVER smoother than that, usually the roughness of the surface is measured in meters and sometimes tens of meters. Meters are a thousands times larger than the millimetric precision they claim. 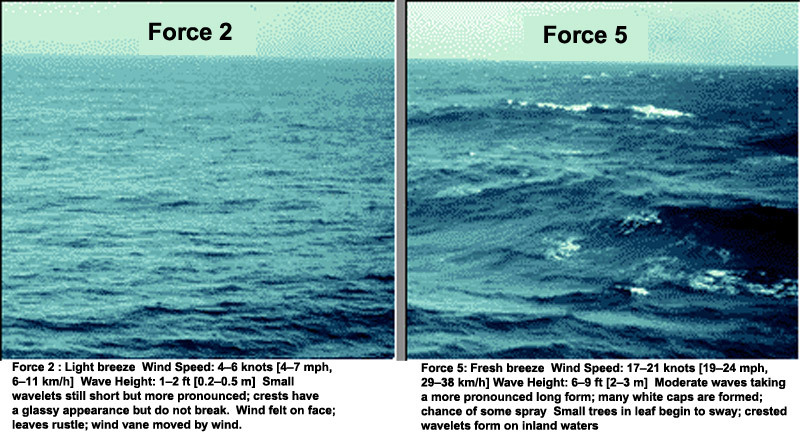 If they were actually on the sea in average conditions, say Force 3 or 4 seas, they could not measure actual sea surface height to even inches or centimeters — no less millimeters. The Tide Gauge long-term rate of SLR is 1.7-1.8 mm/yr — the thickness of a US quarter. satellite since 1993 gives about 2.9 mm/yr, less than the thickness of two US quarters stacked on top of one another. They claim to be able to detect this change of a surface no part of which is ever that smooth. Hey, statistics are wonderful — for some things — but measurement, not so much. RB ==> Look at the photos. I haven’t got the document yet, but the synopsis doesn’t seen to tell how sea level is found from varying wave heights especially to a precision of mm. The altimeter may read to mm, yet can the sea level be determined to that precision? If so, please tell us how. Rob ==> I am familiar with Shum et al. (1995) — and although far out f date, it does outline the process and sources of error. In 1995, they wewre happy to be able to claim +/- 2 inches (5 cm) and that was not real either. Population mean is meaningless if the measurements are known to contain large numbers of errors of unknown quantitative magnitude — Shum makes some of the guesses that they still use today. Measuring a million different tress at a million different times and places doesn’t tell you how tall the pine tree you about to cut is. Lots of vague guesses averaged and then averaged again doesn’t result in a precise answer that can be expected to agree with a physical actuality. I often surprised by the faith some of the readers here place in statistical aproaches to real world problems — a fsith that leads them to believe that vague and sloppy measurements can be resolved to high precision solutions — basically “Magic, by long division”. Still, there you have it — nothing shakes their simple, but blind, faith. Engineers have a different viewpoint and tend to see things more closely to the way they really are, and are more willing to acknowledge that out in the real world, where stuff bangs together, a more pragmatic approach is needed. For sea levels, I am counting on the combined power of Tide Gauge Stations (accurate to +/- 2 cm) to be mated to same-structure, long-term Continuously Operating GPS Reference Stations (accurate with long enough time series to millimeteric scales) to inform us what is happening with actual real world sea surface height. I have been goaded by a reader to write about Sea Level and Fiji — which I have started. Readers may contact me at my first name at the domain i4 decimal net.